I always keep an eye out for moments of beauty in nature when I travel. Here are some I appreciated on my 2018 Caribbean cruise. 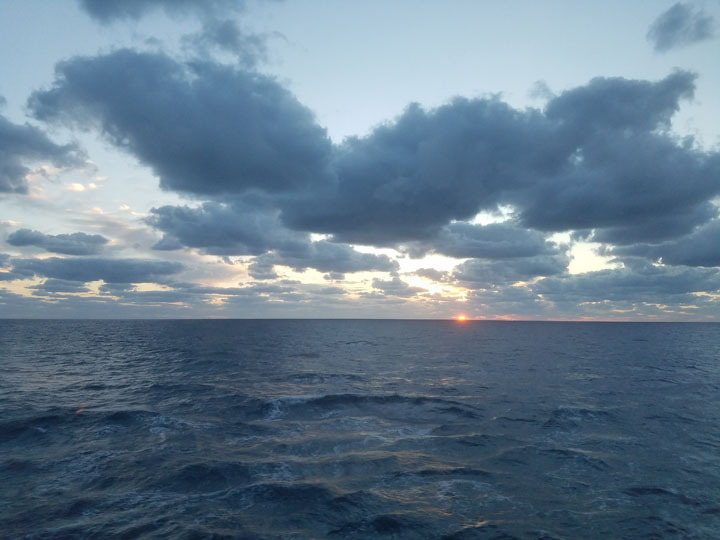 The first night at sea, October 28, 2018, we enjoyed this beautiful sunset. 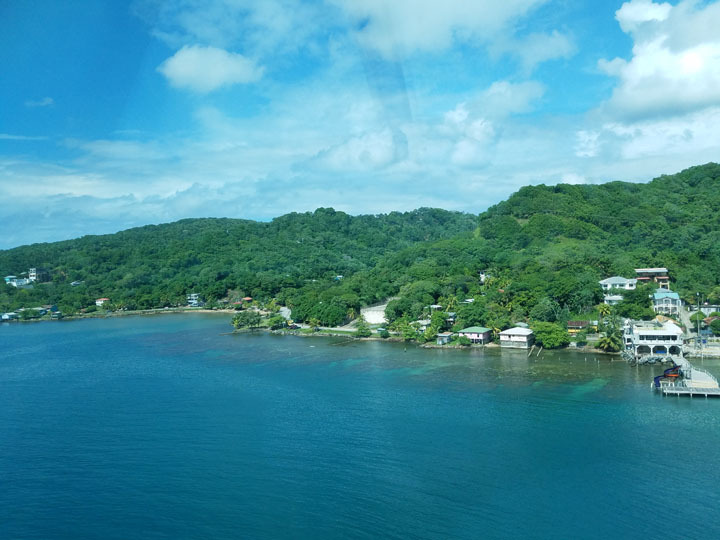 The island of Roatan, Honduras, looked beautiful when viewed from our cruise ship. Photo by Jewel, copyright 2018, all rights reserved. 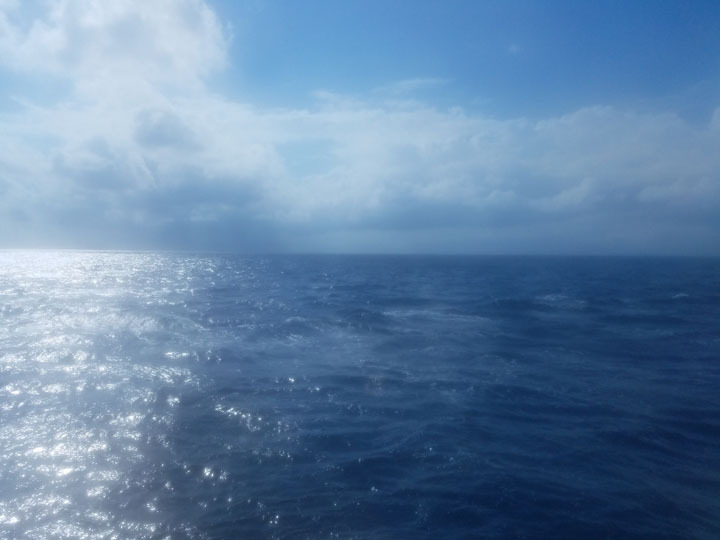 In October 2018, I did something I’d wanted to do my whole life: I went on a Caribbean cruise! One of my friends invited me to join her and share a stateroom with her, and I jumped at the chance! We booked our trip through Susan Strong of Sanborn’s Travel in Corpus Christie. Susan was a pleasure to do business with, and I would gladly recommend her to others. She also came with us on this cruise, and I enjoyed the opportunity to get to know her a bit. This was a one-week adventure, with three stops and shore excursions. Our cruise ship held about 6,000 people: 4,000 were passengers, and 2,000 were staff. It’s amazing to think of the ship as holding more than 4 times as many people as there were in the rural community where I grew up! Before the cruise, I was very frustrated with Royal Caribbean because of the many struggles I had dealing with their buggy web site. Royal Caribbean’s telephone support people were polite, but would put me on hold for 20 minutes at a time, only to come back saying they were unable to solve the problem. Fortunately, once I boarded the cruise, things went smoothly, and I was able to have a great time with my friends! Our ship for this cruise was called Liberty of the Seas, and it was operated by Royal Caribbean Cruise Lines. This floating city featured a large informal dining room with buffet that was open all day, several sit-down dining rooms, bars, shops, swimming pools, hot tubs, a fitness center, a spa, and more. It featured a variety of entertainment on board, including bands playing music for dancing, movies, game shows, and other acts. 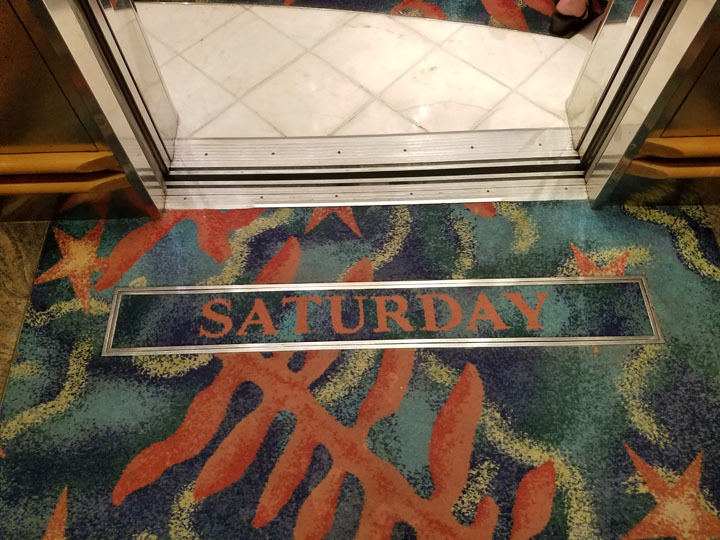 Each day, the carpets on the floors of the elevators on the ship told us what day of the week it was. I found it somewhat fascinating to think there are people whose job it was to change the elevator sign every day. On the top deck, there were two swimming pools: one for children, and one for adults. The children’s pool also featured a water slide. I kept intending to try it out, but somehow my time filled up with other activities and I didn’t get to it. 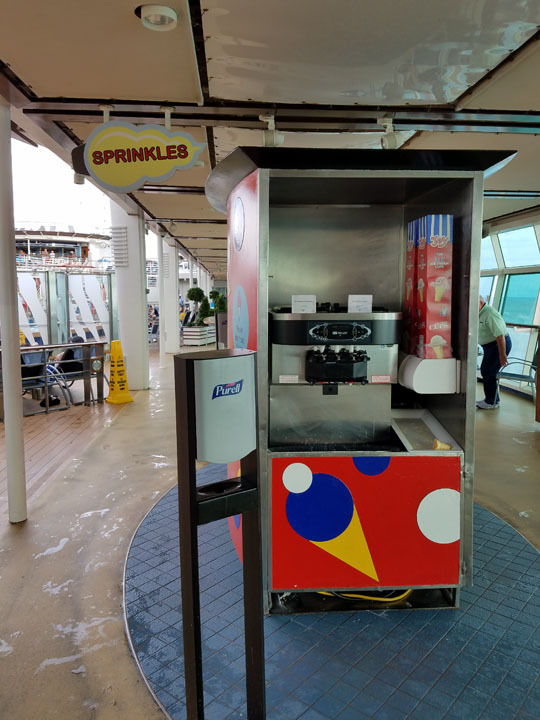 Near the children’s pool is a dispenser of soft serve ice cream (shown above) called Sprinkles. The ice cream cones are free, and I enjoyed several of them during the cruise! The promenade deck was the level that featured many shops, bars, and restaurants. During the week of the cruise, a number of events were held there, including a Halloween party for adults. 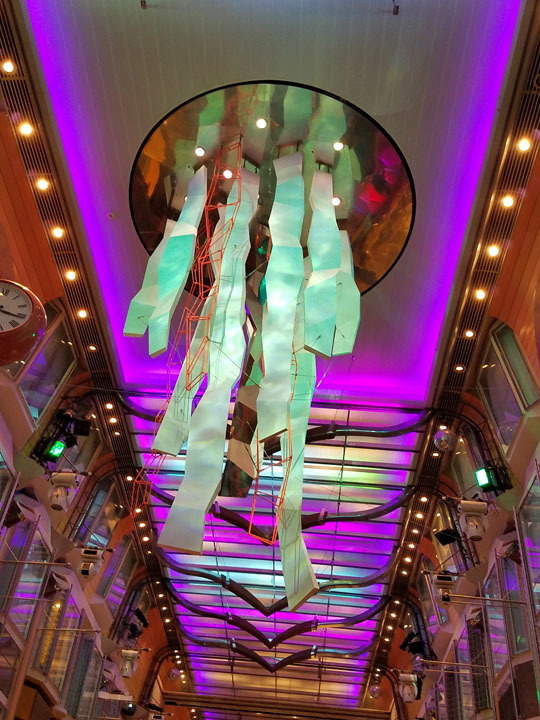 I particularly enjoyed the jellyfish sculpture that hung from the ceiling! I enjoyed several treatments at the spa on board the ship, including three massages, a salt scrub, and a facial. Word soon got out in our group that I was doing this, and the final night of the cruise our organizer Susan gave me a certificate proclaiming me “the Spa Queen”! There were many gorgeous views to enjoy while on board the ship. I found it very peaceful to stand at the side and look out over the intense blue of water and sky. 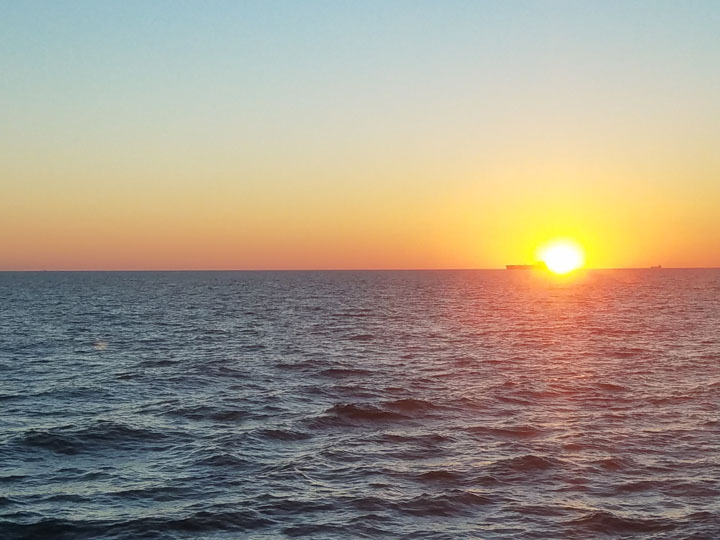 Our first two days of cruising, we were out in the open water of the Gulf of Mexico. 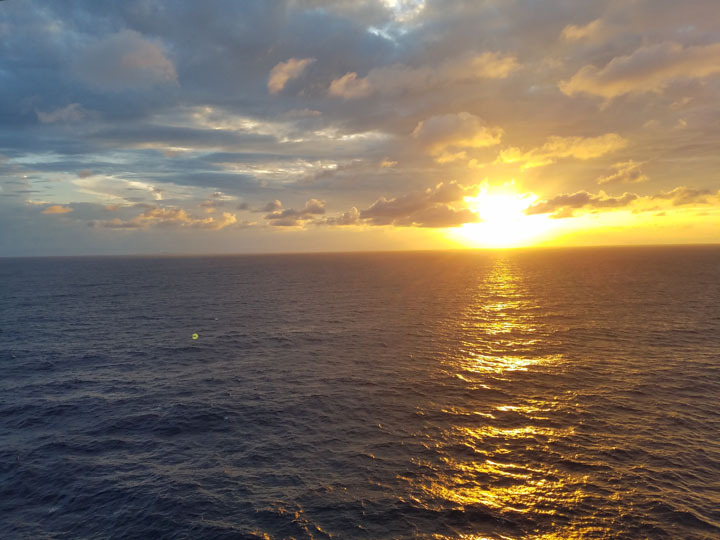 We saw several beautiful sunsets during the cruise. This photo shows the one that greeted us our first evening on board. The ship made 3 stops during the week: Roatan, Honduras; Costa Maya, Mexico, and Cozumel, Mexico. We had the option of either purchasing an excursion package, going into town to shop and explore, or staying on the ship and enjoying the many facilities it offered. The number of options for each stop was amazing. It was so hard to choose what to do! I enjoyed the cruise very much, and would going on another in the future, especially if I had a friend to go with. 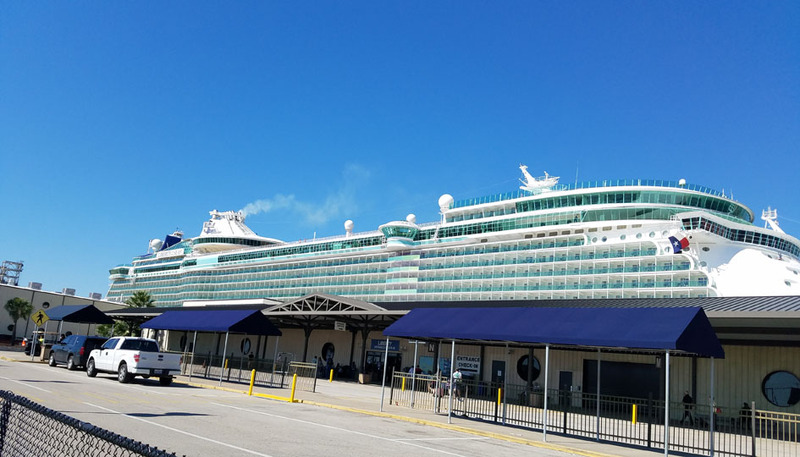 Although Royal Caribbean’s online check-in process was extremely cumbersome due to a poorly designed web site, once I was on board the ship I was able to relax and enjoy the cruise. I took over 500 pictures throughout the week. When we got off the cruise ship, we were met by a representative from Anthony’s Key Resort, which was the local tour operator that was offering this excursion. They took us via bus to the cove where the dolphins lived. There were changing rooms for us to change into our swimsuits, and lockers we could use to store our belongings until we were done. We each received a set of swim fins and snorkel mask, and then they led us down to the water. They said we could bring cameras and phones to take photos. Jewel receives a kiss from Callie. Swimming past our line so we could pet her as she passed. Her skin was very soft. Swimming with her belly pointing up to the sky. Jumping up out of the water. Going to look for objects buried in the sand, then bringing them back to us. 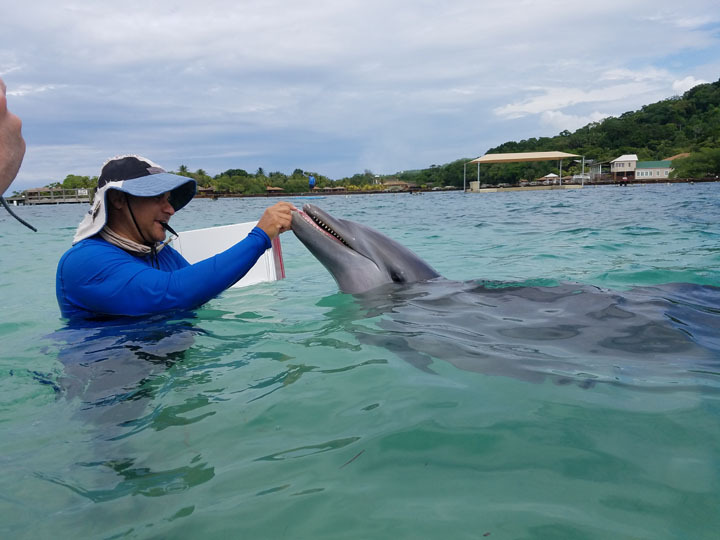 The trainer told us that dolphins have excellent built-in sonar, and they can use it to identify where items are buried. Flapping her tail on the water to make a big splash. Going for a “tail walk”, which meant rearing up vertically out of the water, and then “walking” across the surface of the water with her tail. This was my favorite part! Posing for photos with each of us in turn. The following video shows Callie going for her “tail walk”. For part of the above activities, we had an opportunity to use our phones and cameras to take photos. For the photos where we posed with Callie, a professional photographer snapped photos of each of us, and naturally we were given an opportunity to purchase those at the end of the tour. As an individual (i.e., not part of a couple or family), I was able to purchase a package with all of the photos with me in them for $45. The above “dolphin encounter” activity took about 30 minutes. After the “dolphin encounter” part of our tour, we set our phones and cameras aside and put on the snorkeling gear. We swam out into the cove. As we swam, the dolphins would come along to swim with us. They often chased each other, passing underneath us close enough to touch. Sometimes they surfaced and swam next to us. The bottom of the cove was not as spectacular as what I saw when snorkeling at Maui. The fish were not brightly colored, they were simply a silvery color. There were some coral formations, rocks, and seaweed to look at, but the colors tended to be neutrals. 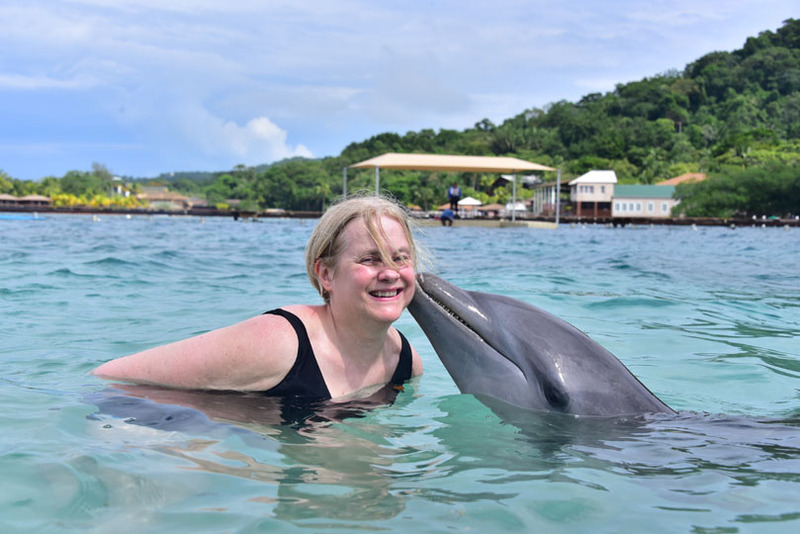 I was happy with it, though, because the dolphins were so much fun! This too lasted about 30 minutes. It felt like the right length of time. At the end, the staff called us to the shore, collected our snorkeling equipment from us, loaded us onto the bus, and took us back to our cruise ship. I went to bed that night happy, dreaming of dolphins! Some people have asked me whether the dolphins seemed to be captives or abused. Based on watching them, I got the impression the dolphins are comfortable in their habitat, and staying there by choice. According to the trainer we worked with, the dolphins who live in the cove were born there. They consider it their home, just as your pet dog would consider your house his/her home. The dolphin behavior I witnessed seemed consistent with that. The dolphins were not restrained, and had enough freedom in a large area that they could have opted to swim away from us and stay away. Callie accepts a fish from her trainer as a reward for indulging the tourists. The cove at Anthony’s Key is fenced off from the open Gulf of Mexico. 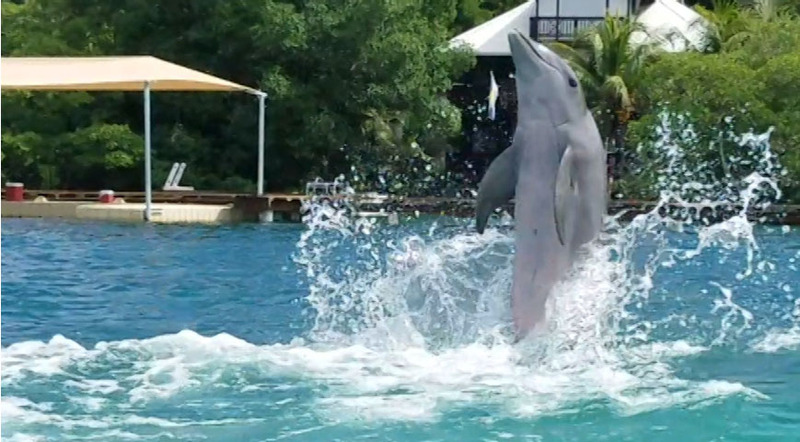 At times, the trainers will open the gate to allow the dolphins to play freely in the open water. 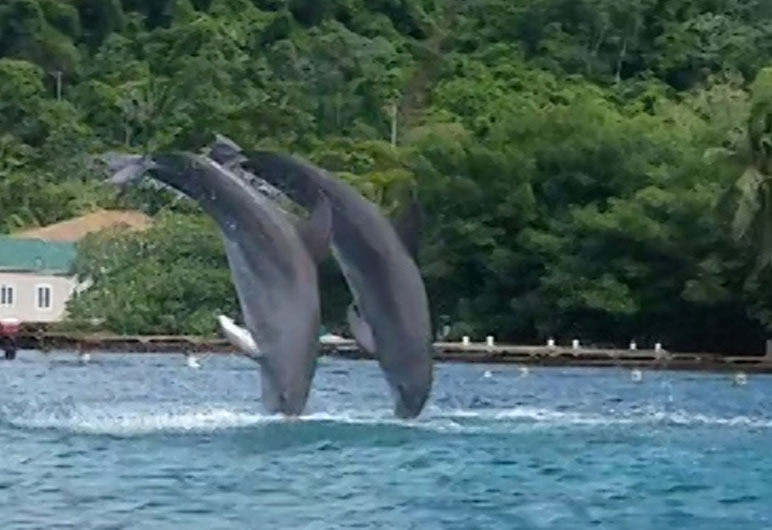 The dolphins voluntarily return to their home afterward. 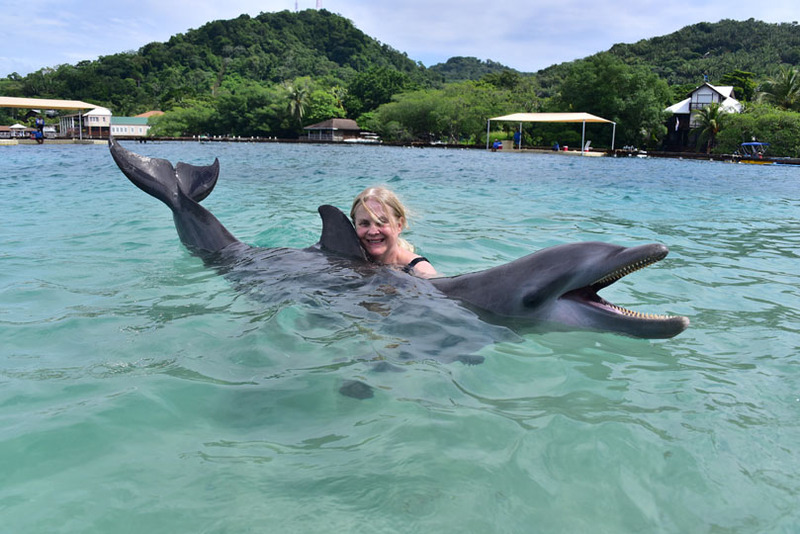 A dog might run joyously around when taken to a dog park, but will choose to return home where his food and his social group live afterward, and the same is true of dolphins. Dry clothes to change into after snorkeling. Sunscreen, maybe also a hat. I’m glad I removed my contact lenses before leaving my room. It’s all too easy for water to get into the snorkel mask and wash a contact lens out of the eye. I did take my prescription eyeglasses, and I wish I would have left them in my locker with my dry clothes when I changed clothes at the cove. I took the sunglasses off when we got into the water, and they became an extra thing to remember to grab and take with me when it was over.